Hello and welcome to my blog. 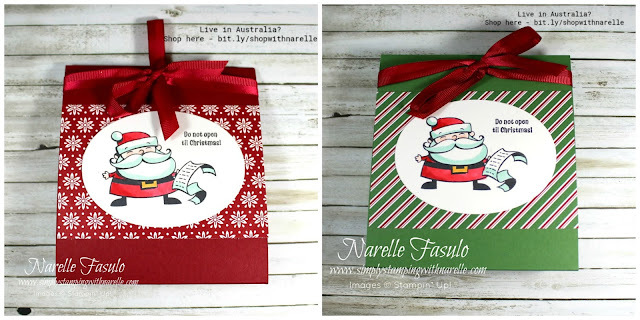 Today I have the easiest Christmas treat holder to share with you. And of course it had to be decorated cutely, so that meant using the Signs of Santa stamp set. Aren't these adorable. And so easy to do. Start with a piece of A4 card stock. Cut longways to as wide as you want your treat holder to be. I cut my sheet in half, so I cut my cardstock at roughly 4". Now score at 5", 6" and 10". Fold up the front panel that is scored at 5". Fold down the top panel that is scored at 10", this forms the top flap. lace some Tear & Tape at the top of the back panel. Attach your treat bag to this tape. If your treat bag is heavier you may also want to staple it. Put Tear & Tape on the inside of the top panel that folds down, and attach it to the treat bag. Your treat bag should now be held firmly in place. Now put Tear & Tape on the inside of the front panel and secure it to the folded flap. Make sure it meets evenly along the top. Now decorate it as you wish. I added a strip of designer series paper to the front. 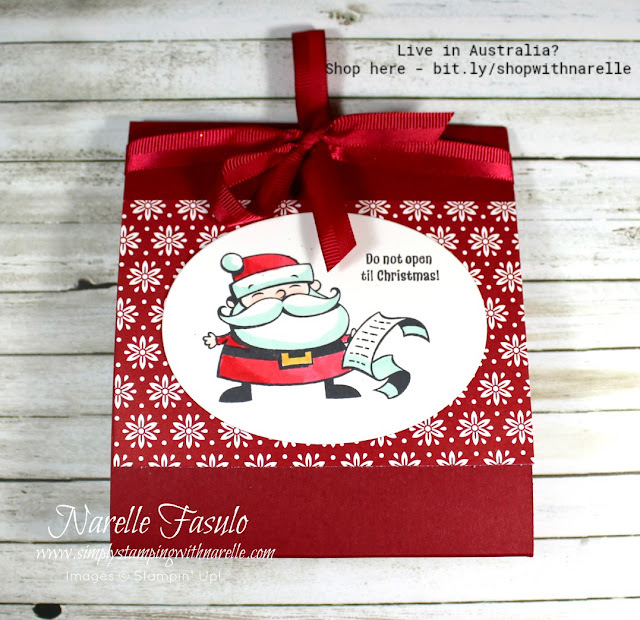 Added a Santa from the Signs of Santa stamp set, then threaded ribbon through the opening and tied a bow. 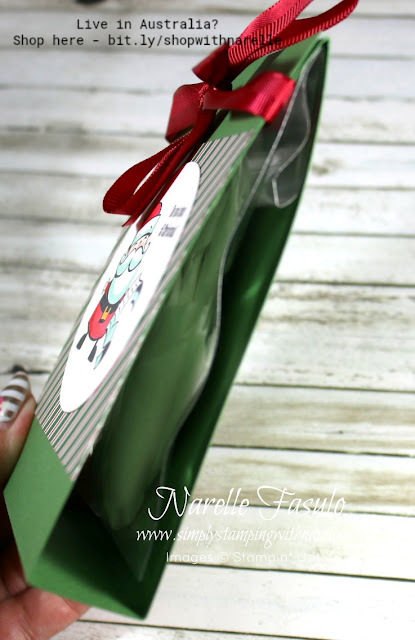 This is such a quick and easy treat bag, you will be making them for everyone you know. To purchase the products I have used on this project, please see the SHOP section below.